Last time, I talked about little ways to change things up for a day or two or tweak your schedule to try and get out of a rut. 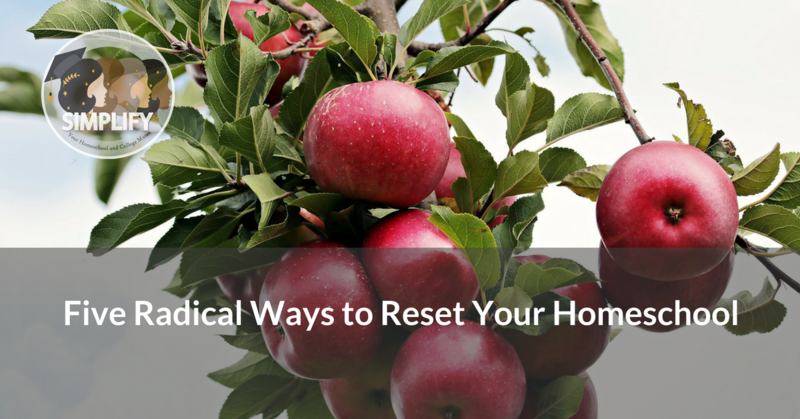 This time, I want to talk about major ways to reset your homeschool if things are rough. We all face rough patches sometimes in homeschooling. Sometimes it requires that we really step out of our comfort zones or think about homeschooling in a new way. Get someone else to teach. Sometimes it’s time to raise the white flag of surrender and let someone else teach your child, especially for middle and high school students. If writing or math have become a battle, then there are lots of options out there now for online courses. You can also look at hiring a tutor. Sometimes you can find a good college student for a reasonable price. If your schedule is too much of you and your child and she needs a break, there are more options for creative and interesting online courses now than ever. If your budget is limited, then free lecture courses online or from your library can be another good way to hand off the primary teaching for an older student. If you’ve tried lots of things and it’s not working, then it’s okay to hand off part of your schedule to someone else. Homeschooling means doing the best thing for your student. Sometimes that means finding someone else to teach. This suggestion probably makes some parents instantly anxious. However, if everyone is tearing their hair out, it may be time to stop for a little while. It’s only a month. No student’s future was ever ruined in a month. I promise! Spending some time unschooling means letting go of all your formal curricula and seeing what happens. It can give you time to observe your student’s habits when you’re not pushing a particular school agenda on them. At the end of the month, re-evaluate. Maybe your student discovered a new passion or hobby that you can incorporate into school. Maybe you and your student need more time to unschool, or need to relax your academics. Or maybe it helps your student realize that he likes having a solid schedule and needs more structure and specific goals. Unschooling can be a good way to get to know yourselves and take a breath, away from formal academics. It’s absolutely worth considering if you’ve been struggling for awhile. I don’t just mean move things around in your schedule. That’s useful if you need a small homeschool reset. However, if things aren’t working in a big way, then you need a big change. If you’ve always had a strict, down to the minute schedule, it’s time to try a loose routine, and vice versa. One of the greatest challenges in teaching can be teaching in ways that aren’t right for us, but are right for our students. Maybe you gravitate toward a loose, open-ended style, but that simply doesn’t work for your student. That means it’s time to change, at least for school. In the end, your approach has to suit you and your student. However, to get that reset, you need to really step outside your comfort zone sometimes. Try out a schedule and approach that’s the antithesis of what you usually do and see how it goes. If nothing else, it will teach you something about yourself and your student. Let the kids choose the curriculum. If things really aren’t working, back up and let the kids be in charge for a little while. If you have older kids, hopefully you already are in the habit of consulting your students about their learning. However, if you’re not and things aren’t going well, this is the perfect time to start. Sit down with a catalog or in front of your favorite homeschool curriculum websites and help the kids build their own programs. Even if you don’t formally articulate it, you probably started out homeschooling with a particular vision and set of goals. When your student isn’t fulfilling that vision, things can get difficult. Sometimes, the best thing to do is to sit down and really take a hard look at your goals, whether you’ve ever done that before or not. The times that I’ve seen this be really useful are when a parent’s vision no longer meets their child’s needs. If you started out planning to read the greatest works of literature with your student, and he turned out to be an engineer who’d rather take a computer apart, then your goals are probably holding both of you back. I’ve also seen it be useful when a parent is stuck on daily tasks and has lost track of the big picture. If you’re spending every day arguing about each assignment with your student, it may be time to go back to your goals and decide what’s really important. Figuring out if those individual assignments actually fulfill your most important goals can help you figure out what needs to change. It can also help refocus your thinking. If your primary goal is to help your student love learning or to make sure your student is emotionally healthy, then focusing on the daily grind may not be meeting those big goals. That’s something that’s easy to forget in the moment. Once you’ve figured out what’s really important, then you can think about redesigning your approach to school.